Hello again friends!! I'm so glad you're back, because you will not want to miss the peeks of this gorgeous new Power Poppy set called So Grateful. I am in serious LOVE!! I chose to use the Dahlia collage for today. Isn't this flower arrangement stunning? And it's so easy to color. Marcy does all the work for you with her strategically sketched shadows. And the color combos are limited only to your imagination. I colored and fussy-cut out the image and layered it on a diecut panel with dimensional tape. The frame is also popped up, with dimensional tape, over the Enchanted Garden (BoBunny) decorative paper. That's it. I really went CAS this time around folks. I don't know what's gotten into me. 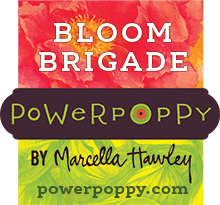 Tomorrow is the Power Poppy Hop y'all. Be sure to stop by for a little more inspiration for heading on over to Power Poppy to make your purchases! Thanks for all your warmth and encouragement! Oh, Tosh, this is gorgeous! It may be CAS for you, but the colors of this beautiful dahlia array are gorgeous, and the fussy cutting is always fabulous. I love the reverse frame with the DP set back...perfect palette for your image. And the sentiment is fabulous...I really think I'm going to love and use them lots! Beautifully done, as always, my friend! Hugs! This is gorgeous! I'm so excited to see dahlias in this new release. I have a background stamp that makes those quatrefoils in you decorative paper, and now I have ideas . . . Totally gorgeous and I HAVE to have this set!! Seriously CAS, for you! I love your usual style so much, and I popped by to see what frosted and bling would look like on the new set! That said, I think CASAlso agrees with you! Oh so beautiful! Your frame looks awesome and I do like the colors. Beautiful. I would have never in a million years known how to use that fabulous paper, but you made it positively sing as a background for your amazingly colored dahila! WOW! Make that WOW x2! :) You really had your mojo a'flowin this whole release week, girlfriend!